Got to love the Internet for providing the basis to connect the threads of history! See my comment proposing the connecting the thread at the end. In the last post, I related a Knickerbocker family legend that the fort near the Mansion was occupied by Hessian soldiers at the time of the battle of Saratoga. Though I doubt very much that that was true, there is no doubt that there were bands of Tories, Indians, and perhaps Hessians and British roaming through the area during the summer of 1777 before the battle of Saratoga. Major Dirck VanVeghten of the local militia unit, the 14th Albany County, was killed by one band when he came from Saratoga just before the battle to check on his home in Schaghticoke. 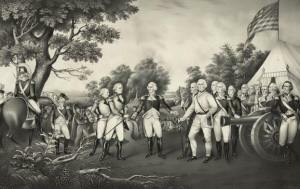 One source states that VanVeghten came home on “an intelligence gathering mission.” In either event, he was accompanied only by Solomon Acker, one of the soldiers in his company of the 14th Albany County Militia.